Q: Today the Japanese government claimed that a submarine of unknown nationality came within twelve nautical miles of Diaoyu Dao's contiguous zone and that a Chinese naval ship was likely to have entered the same area. The Japanese side has lodged a protest about this. Please confirm this information. A: According to the information received by the Chinese side, this morning two vessels of Japan's Maritime Self-Defense Force entered a contiguous zone northeast of Chiwei Yu. The Chinese navy was there to track and monitor the activities of the Japanese vessels. Now the Japanese vessels are no longer in the relevant contiguous zone. I must stress once again that Diaoyu Dao and its affiliated islands are China's inherent territories and that China's sovereignty over Diaoyu Dao has a solid historical and legal basis. The relevant actions of the Japanese side will by no means change the established fact that Diaoyu Dao belongs to China and neither will they shake China's firm resolve to safeguard the territorial sovereignty of Diaoyu Dao. 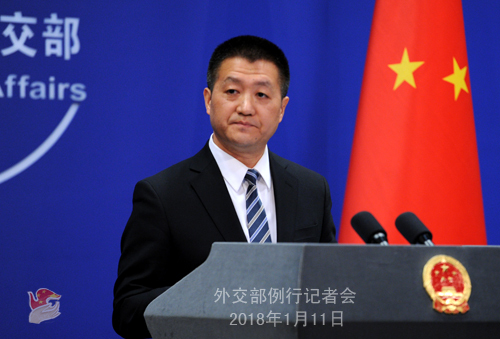 The Chinese side urges the Japanese side to stop making troubles on the Diaoyu Dao issue, abide by the four-point principled agreement reached by the two sides in 2014, work together and move in the same direction with China, and make concrete efforts to improve and develop bilateral relations. Q: According to reports, when having a telephone conversation with the ROK President Moon Jae-in, the US President Donald Trump expressed his openness to holding talks with the DPRK at the appropriate time and under the right circumstances. What is your comment? A: We have noted relevant reports. We have been saying that the international community has been paying close attention to the recent positive interactions between the DPRK and the ROK. The Chinese side welcomes all the efforts that are conducive to easing the situation on the Korean Peninsula and bringing the Korean Peninsula issue back to the right track of seeking settlement through dialogue and consultation. As we have said many times, the US and the DPRK are the parties directly concerned on the Korean Peninsula nuclear issue. We share the same hope with the international community that the US and the DPRK can meet each other halfway and take meaningful steps towards dialogue and interaction. The Chinese side stands ready to continue with its own efforts to bring the Korean Peninsula nuclear issue back to the track of seeking settlement through dialogue and consultation. Q: We have noted the news about Premier Li Keqiang's attendance at the Second Lancang-Mekong Cooperation (LMC) Leaders' Meeting in Cambodia. Could you elaborate on the defining features and strength of the LMC framework? What are the highlights of the LMC in advancing China's pragmatic cooperation with the relevant countries and improving the local people's livelihood? A: The LMC is the first new type of sub-regional framework jointly initiated by the six riparian countries. Its defining features are equal consultation, pragmatism and efficiency, and openness and inclusiveness. The six countries, irrespective of their size, strength or wealth, make decisions through consultation and fully accommodate each other's concerns and comfort level. The LMC is not a talk shop but action-oriented. It does not seek to form any exclusive club but remains open to cooperation for the common socio-economic development of the six countries. The LMC is mutually reinforcing with the China-ASEAN cooperation and it is complementary to other cooperation mechanisms in this region, jointly contributing to the region's long-term peace, stability, development and prosperity. Since its inception in March 2016, the LMC institutional building has made steady progress with major projects moving forward smoothly and people-to-people exchanges flourishing. The cooperation among the six countries has entered a high-speed era and brought tangible benefits to their people. The LMC has provided support to over 20 large infrastructure and industrialization projects in the Mekong River countries, conducted more than 100 medium and small-sized projects to improve livelihood, offered the Chinese government's scholarships to over 12,000 students in the Mekong River countries and over 3000 training opportunities to in-service staff and helped nearly 800 cataract patients in Cambodia, the Laos and Myanmar regain their sight through the Brightness Action. In the future, we will conduct more cooperation in such key areas as water resources, connectivity, production capacity, agriculture, human resources development, health care in an effort to bring more benefits to people of the six countries. Q: Yesterday, Vietnam's Ambassador to India said that Vietnam welcomes India's investments in oil and natural gas sector in the Exclusive Economic Zone of the South China Sea. He also said that Vietnam always welcomes port calls by Indian naval ships in the South China Sea. What are China's comments? A: We have no objection to the development of bilateral relations between relevant countries in our neighborhood. However, we are firmly opposed to relevant parties' capitalizing on that to infringe upon China's legitimate rights and interests in the South China Sea and undermine regional peace and stability. Q: The Second Ministerial Meeting of China-Community of Latin American and Caribbean States (CELAC) Forum will take place in Chile at the end of this month. 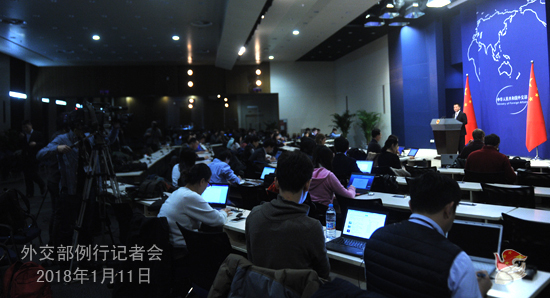 What does China expect from this forum and do you have any details about the Chinese delegation that will attend it? A: The China-CELAC Forum serves as a major platform for China to carry out overall cooperation with all Latin American and Caribbean States, which is of great significance to cementing and promoting China-CELAC win-win cooperation and elevating China-CELAC Comprehensive Cooperative Partnership to a higher level. With regard to the Chinese delegation, we will release relevant information in due course. Q: Bloomberg yesterday reported that China is looking to slow or stop purchases of US treasury bonds. I know the State Administration of Foreign Exchange (SAFE) has made a statement about that, but does the Foreign Ministry have anything to add? A: Just as you said, the State Administration of Foreign Exchange (SAFE) has released information. It's by reading some media reports that we have learnt about that news. According to our preliminary judgment, the news may have quoted a wrong source or it may be fake news. China's foreign exchange reserves are invested and managed based on the principle of diversification in order to guarantee the overall safety of the foreign exchange assets and to preserve and increase their value. Like other investments, the buying of the US treasury bonds with foreign exchange reserves is a market behavior and is managed professionally in accordance with the market conditions and needs for investment. For both foreign exchange reserves themselves and the market they are in, the Chinese department that manages foreign exchange reserves is a responsible investor and the relevant investment activities have ensured the stability of international financial market and helped to preserve and increase the value of Chinese foreign exchange reserves. Q: According to reports, on January 10, the European Union's ambassador to China Hans Dietmar Schweisgut said at a press conference that in the new year, Europe is looking forward to further deepening cooperation with China on connectivity and that the EU is drawing up the blueprint on its connectivity with the Eurasian continent and alignment with the Belt and Road Initiative. What is China's response to this? A: The day before yesterday, when taking the question from one of you, I said that President Macron expressed France's willingness to take an active part in the international cooperation under the Belt and Road Initiative during his visit to China. The Chinese side welcomes that and Europe's active participation in the Belt and Road Initiative. We would like to follow the principle of extensive consultation, joint contribution and shared benefits to seek greater synergy with Europe's development strategies and achieve win-win outcomes through pragmatic cooperation in various areas such as connectivity with a view to promoting the greater development of China-Europe partnerships for peace, growth, reform and progress of civilizations, making concerted efforts to fuel the development and prosperity of the Eurasian continent and jointly contributing to building a community of shared future for mankind. Q: There are reports that China is planning to fund the construction of a counter-terrorism base in Afghanistan. Can you confirm that? A: I have not heard of the information mentioned by you. The Chinese side always supports the international counter-terrorism cooperation conducted on the basis of mutual respect. Q: President Emmanuel Macron of France has just wrapped up his visit to China. What are China's comments on this visit? Some observers believe that the outcomes achieved in the economic and trade area during this visit fall short of expectations. What is your response to this? A: At the invitation of President Xi Jinping, President Emmanuel Macron of France paid a state visit to China from January 8 to 10. The two heads of state had an in-depth exchange of views on bilateral relations and major international issues, during which they enhanced mutual understanding and political mutual trust and reached broad consensus. China and France issued the Joint Statement, which gave a full account of their common views on bilateral relations and major issues in today's world. The two sides agreed to further elevate their close and enduring comprehensive strategic partnership on the basis of mutual respect and mutual benefit. It is fair to say that this visit has achieved full success and reaped positive outcomes in such areas as politics, economic cooperation, trade and people-to-people exchanges, which fully demonstrates that China-France relations are comprehensive and strategic in nature and laid a solid groundwork for the growth of bilateral relations in the new era. We have noted that some media paid attention to the economic cooperation and trade between China and France. I want to emphasize that pragmatic cooperation, the economic cooperation and trade in particular, is one of the key topics during the talks of the two heads of state. The two sides have mapped out a blueprint for future cooperation in various areas in the spirit of mutual respect, friendly consultation, taking a long-term perspective and win-win outcomes. The two sides agreed to give priority to deepening cooperation in such traditional areas as civilian nuclear energy, aerospace and aviation and comprehensively expanding cooperation in emerging areas such as agricultural food, environmental protection, advanced manufacturing, innovative research and development and finance so as to achieve a higher level of win-win cooperation. The two heads of state also had an in-depth exchange of views on the cooperation under the Belt and Road framework and reached important consensus on jointly advancing the Belt and Road Initiative and striving for the prosperity of the Eurasian continent on the part of China and France. At last, I would like to stress that China-France relations have extended far beyond the simple buyer-seller relationship with the breadth and depth of their cooperation being expanded, the vitality and potential being enhanced and their interests getting more intertwined. We are full of confidence in the prospects of the growth of China-France relations. Follow-up: Regarding the issue of the Chinese naval ship, China-Japan relations have recently been improving, and the Chinese government also said that it hopes to jointly push forward the further improvement and development of China-Japan relations. Why did the Chinese side take relevant actions at this juncture? A: As to the situation you mentioned, just now I have elaborated on the position of the Chinese government, whose kernel is that Diaoyu Dao and its affiliated islands are China's inherent territories. It is beyond dispute that the Chinese side conducts activities in its own territorial waters. We have also said that the relevant actions of the Japanese side will by no means change the established fact that Diaoyu Dao belongs to China and neither will they shake China's firm resolve to uphold the territorial sovereignty of Diaoyu Dao. On China-Japan relations, I would like to stress that the Chinese side attaches great importance to China-Japan relations. We also heeded the positive signals recently sent out by Japanese top leadership on improving bilateral relations. We hope that the Japanese side can match its words with deeds, abide by the four-point principled agreement reached by the two sides in 2014, move in the same direction with China, and make concrete efforts to improve and develop bilateral relations. Q: What are China's comments on the US House of Representatives' recent passing of the Taiwan Travel Act? A: We have taken note of relevant reports. I must stress once again that the act severely violates the one-China policy and principles in the three China-US joint communiqués and interferes in China's internal affairs. We express firm opposition to it. 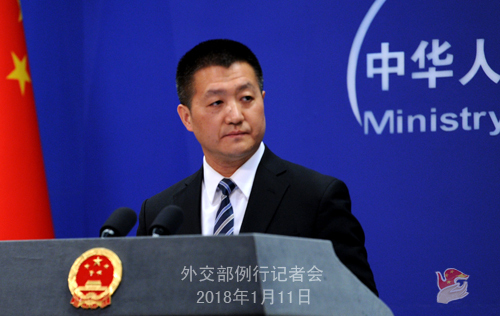 The Chinese side urges the US side to abide by the one-China policy and principles in the three China-US joint communiqués, prudently handle the Taiwan issue, refrain from engaging in any form of official exchange or contact with Taiwan or sending any wrong signals to the "Taiwan independence" separatist forces, and take concrete actions to uphold the larger picture of China-US relations and the China-US cooperation in international affairs. 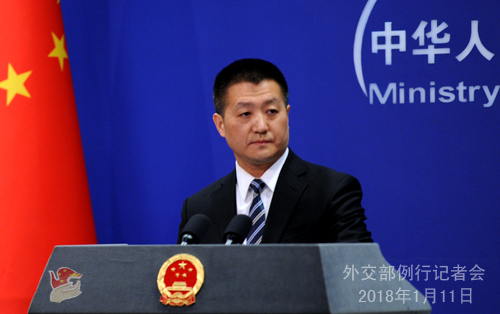 After the press conference, the following question was raised: according to our information, the spokesperson of the National Iranian Tanker Company said that China did not help to rescue those missing Iranian crewmen in the oil tanker collision accident off the coast of the East China Sea. Though having a lot of firefighting equipment and personnel near the burning tanker, China is not using them. What's your comment? Spokesperson Lu Kang said that such remarks are totally contrary to the facts. Since the accident happened, the Chinese government has attached great importance to it and made all-out efforts to conduct maritime search and rescue for the shipwrecked crew. China maintains communication with the Iranian Embassy in China. The China Maritime Search and Rescue Center has coordinated and dispatched a large number of rescue forces to engage in the search and rescue efforts on the spot in a scientific and effective manner. The wrecked ship that carries 130,000 tons of condensate oil is still burning and exploding. Meanwhile, the sea conditions are rough in the waters where the accident took place, and you can well imagine how difficult and dangerous the rescue is. When faced with security threats, the Chinese rescuers approached the tanker at the risk of their lives many times to search, rescue and fight the fire at close range. At the same time, China has been coordinating with the rescue teams from Japan and the ROK. A case involving human life must be treated with the utmost care. This is how we perceive this matter and we also act exactly in that vein. We hope that the relevant sides will learn about their information through official channels including the China Maritime Search and Rescue Center and not readily believe information from other channels, lest that should disrupt and negatively affect the rescue efforts.